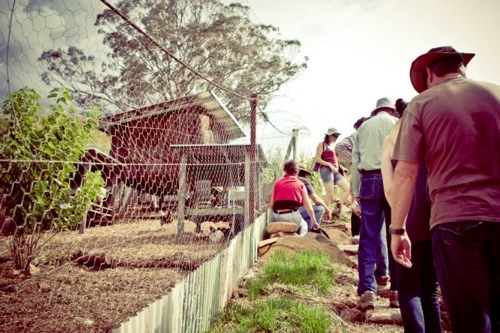 The Gravity Chicken Run is now entering its second winter as one of the gravity-powered (and chicken powered) composting experiments at Milkwood Farm. We’ve made some modifications since last winter, and things are looking good. 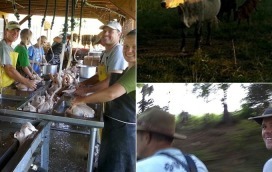 As with all on-farm experiments, we’re learning as we go. But egg production is good and, as we continue to tweak things, all-round chicken happiness is high. 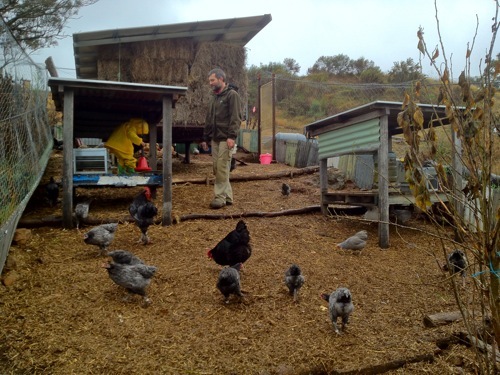 Gravity Chicken Run in Winter 2011… going well, but could use some terracing logs and heaps more mulch. 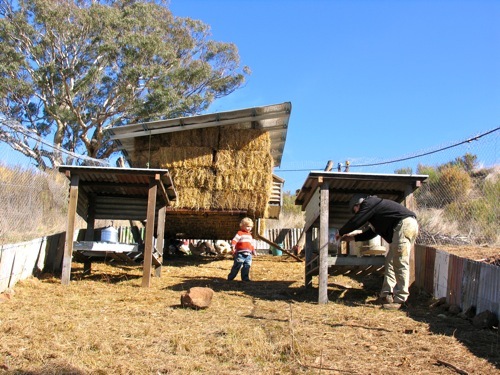 The Rawbale Chicken House is working well – keeping the chickens warm and snug while allowing for good airflow. And the sloping run seems to be working well too – especially now that we’ve made bush-terraces in it to slow the flow of mulch downhill! The idea with this chicken run (or straw yard, as it’s become known) is that weekly we dump a wheelbarrow full of straw in at the very top of the run, which over time the chickens scratch down the hill. The whole hill becomes a great slumping mass of mulch, and by the time it creeps to the bottom, it’s somewhat composted and ready to be taken away via the bottom door, to be used elsewhere on the farm. The run itself now has horizontal bush logs every 2-3 meters or so. This is helping to prevent erosion and, more importantly, means that all the mulch we constantly put in the top takes a fair while to make it to the bottom. The chickens love this. Oh how they love it. Because the chickens are scratching throughout the yard constantly, they’re essentially moving the whole mass of mulch (with incrementally more and more chicken poo as it descends) all the way down the hill. But the mulch also moves slowly enough for weed seeds to sprout (and then get eaten by chickens), for worms and grubs to venture into (and then get eaten by chickens), and creates a magnificently aerated, deep litter, which is about 20cm thick all the way down the run (and up to 30cm on the upsides of the log terraces). 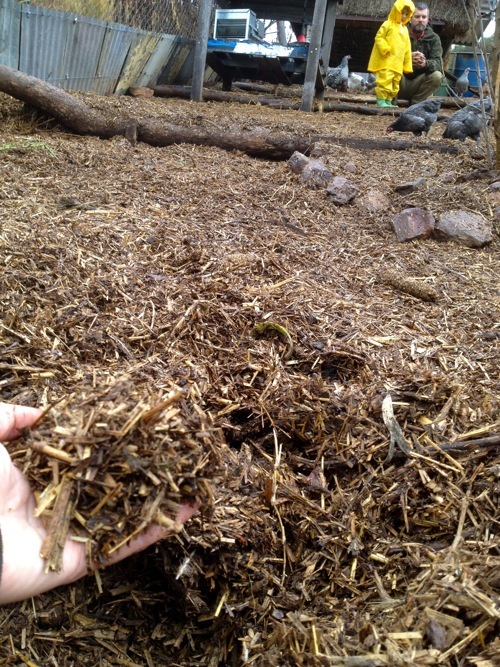 By the time the mulch reaches the bottom level of the yard it looks like… well, finely chopped straw with benefits – half broken down carbon material, laced with aged chicken manure. It’s certainly not completed compost, but that is ok. There are many systems waiting for its goodness! 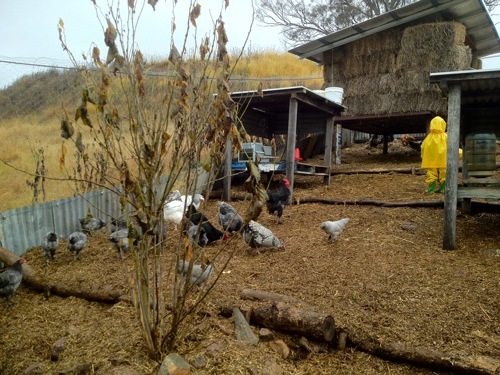 Deep litter in constant motion means happy chooks and healthy, composting mulch. It even smells great. We’ve also added a black mulberry in the middle of the yard, which the chickens are loving for both the extra shade and also its mulberries and the leaves, both of which they eat with gusto. This winter we’re also planting pockets of chicken forage within the run, which we’ll periodically protect from the chickens, then let them loose on. All in all, this is certainly a system that seems to be working. 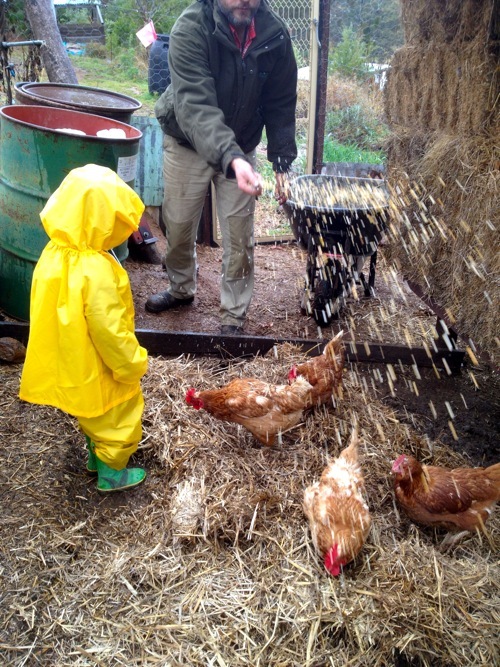 It won’t be the only chicken system on Milkwood Farm come Spring (we have plans for egg mobiles and broilers), but it will remain as a central chicken straw yard, being as it is right next to the food forest and the tinyhouse. 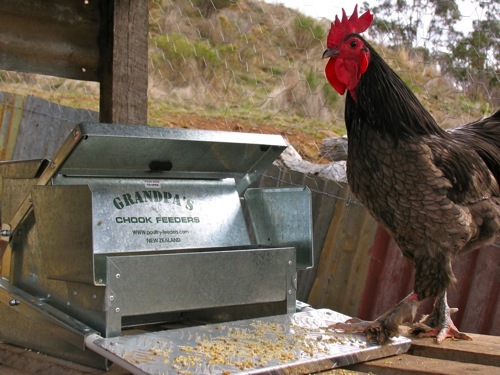 In other news, after 6 months of use I can say that the Grandpas Chicken Feeders are a success, and of great benefit for preventing the rats and mice and antechinus and possums and currawongs and parrots and everything else from eating the chooks’ feed. Apart from the currawongs that is, who gang up and stand 3 abreast to make the lever mechanism work and take it in turns to feed. 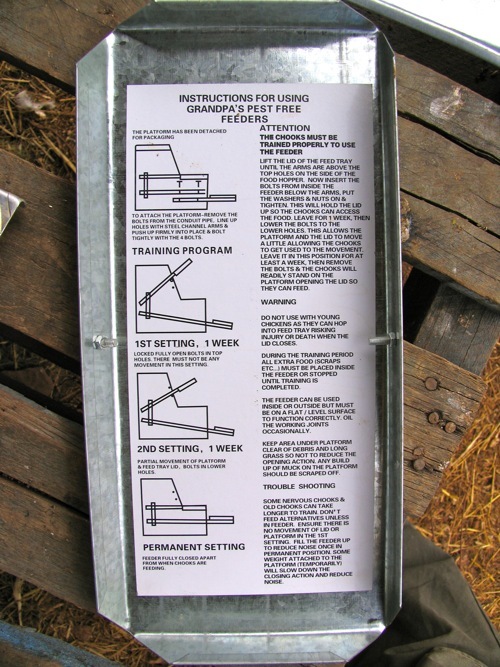 But they seem to have tired of that trick, so we’ve not activated the money-back guarantee on these none too cheap feeders. They’re working well and will likely outlast us all. What do you get when you cross a sustainable fisheries bloke with . . It's the pace of everything, that gets you most of all - everyone . . I love your run, really quite ingenious! Is there anything you would change or do differently if you had the time/money/resources? If you don’t have a slope, there’s no need to worry. Rick Coleman has one of the better deep litter systems I’ve seen. 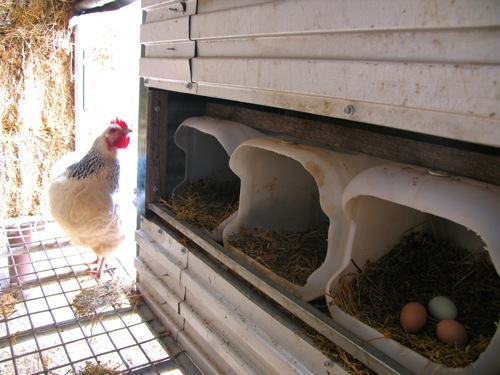 He just has 2 separate sections within the chook house, with one open at a time. They load about 500mm of any old carbon material in and feed the chooks their scraps in there for the next few months. 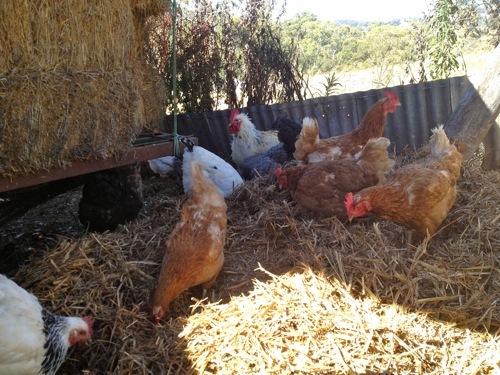 The chook manure adds the required nitrogen and the aeration happens when the chooks dig down for the worms that inevitably come after any uneaten scraps. Like a dual chamber composting dunny, one section matures while the other is being utilised. When you’re ready to head back in you’ve got some nice (if not a little rough at times due to corn cobs etc) finished compost. One tip, when you are designing the shed, take the depth of carbon material into account so you don’t have to bend over. Are you planning on planting anything on the outside, downside of the pen to utilise any nutrients that might wash through? My (non-intentionally designed but just because I have a sloping block) gravity run has a low fence on the downside that is covered with rambling marionberry canes that are very happy in that spot. Perhaps you’ve noticed the grass is greener on the downside to the run? Happy hens indeed! You don’t happen to want a few Pekin cockrels by any chance? Or a Golden Sebright Bantam cockrel? Anyone??? 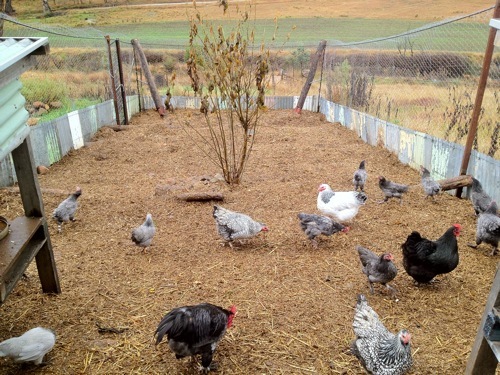 I have a couple of salvaged stripped mattress springs strategically placed around in our chicken yard – allows green manure/ green pick to germinate, then be consumed, refuge for some worms and a bit of protection for tree roots works quite well. We didn’t design our run as explicitly as have, but it’s the same result. Poo and organic matter that can be used elsewhere. We put in terracing as well just to prevent the soil and everything above it all ending at the bottom. Please to read about the Grandpa feeders. Chook feed attracts rats/mice which attracts cats which have decided that after a hard night looking for rodents, that playing with chickens is quite the lark. I almost purchased, but balked at the cost (a little north of $200). Maybe next time I see them. I have a garden going/growing in my yard and I’ve read a million books but the best stuff I learn is taught to me by the land itself. This is wonderful! Very cool ! I love this .. Doing a great job! Nice to see it progressing. Our chicken yard has been like this for the past few seasons. 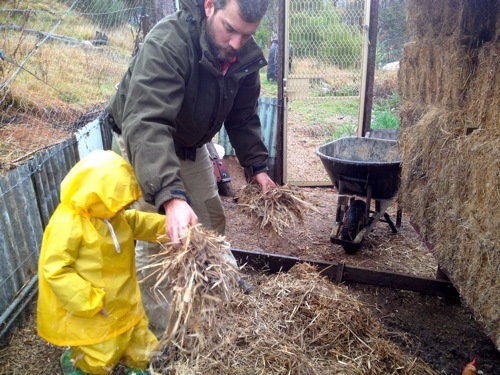 When we muck out the coop we toss it into the run and they scratch through it for spilt grain, then whenever we have excess organic matter like leaves, woodchips or brush we toss it in. We also pile in comfrey and other green material. We’ve got a few log terraces as well, and at the bottom of the slope, a nice 12 or 14 inch deep mass of beautiful compost—lots of worms and goodies for the chooks! Anyways, I’m continuing to enjoy the blog. Cheers! That is sooo awesome! I love how the weed seeds will sprout, and I love how the coop stays fresh and clean. Can’t wait to try it! This is an amazingly clever idea, I love it! Thanks for sharing. Cockatoos have NO trouble getting into my ‘grandpa’s feeder’. 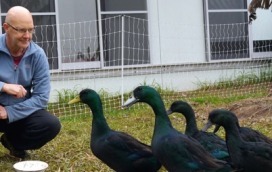 They’ve worked out that if two of them stand on it, it opens and they can eat to their heart’s content. After a season of no fruit and fat cockatoos, I’m thinking they have no redeeming qualities…. 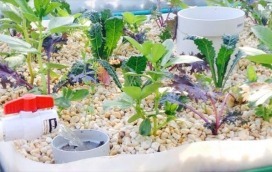 Awesome idea….how smelly does the composting matter get? Could it be done on a smaller scale on a residential block? Love the idea of letting the chickens work it, just not sure what the neighbours would think. 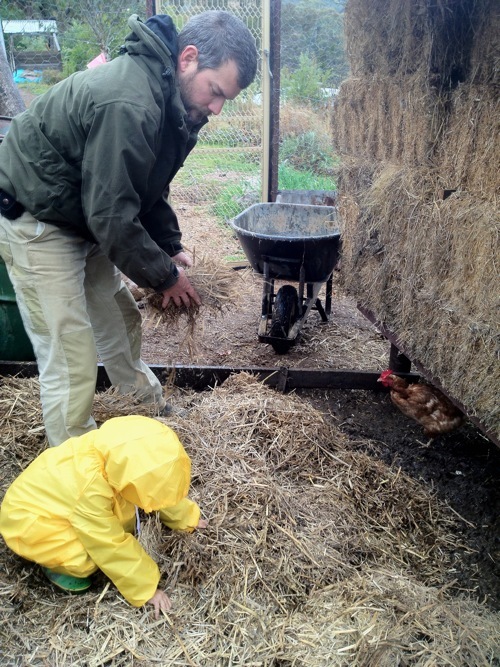 At the moment we clean the coop out as needed and it gets popped into the spare composter until the tumbler is free.